After leaving school, I trained as a Mechanical Engineering Draughtsman then progressively moved on through various roles until work brought me to Bristol in 2006. I met my Canadian wife a year later and had a good couple of years together, however there was a cloud on the horizon. She missed her family and friends and wanted to return to Canada, did I want to come? Not being close to my family in the UK there was nothing to lose and so the processing fees were paid and a mountain of paperwork was processed. We moved to Canada in 2009, married in 2010, and later that year my daughter was born. I drifted apart, not helped by the number of hours I was working and my deployment to a remote Uranium mine in Northern Saskatchewan. I worked a 7-day rotation, flying in for 7 days then flying out for 7 days at home. It was hell for everyone. We started arguing, then stopped talking. The marriage failed and I was asked to leave, reluctantly I did, this turned out to be my demise. After the house was sold, I hung around for a couple of months sleeping on the floor of an empty studio flat slipping into a deep depression. I quit my job, started drinking and stopped eating. I became involved with the wrong kind of people which culminated in a couple of unpleasant situations. That was my ‘SORT IT ! !’ slap in the face. 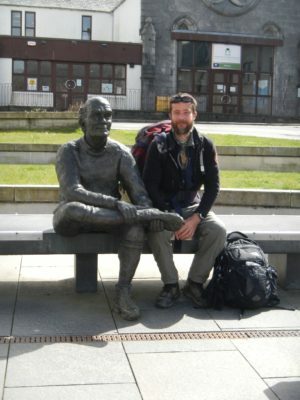 I decided to return to the UK and walk from Lands’ End to John O’Groats, healthy body, healthy mind. The head reset button had to be pushed. I completed my walk along the UK and returned to Bristol mid-May with £400 in my pocket. I booked into the Backpacker hostel with a view to finding some quick casual work through the agencies. I couldn’t even register without documents showing current address, the situation not helped by the fact that I had been out of the country for six years. The money quickly ran out and onto the streets I went. After spending a couple of nights on the streets and a couple of months in a night shelter, it just wasn’t working. There is only a certain amount of time you can spend in the libraries. I spent a lot of the time walking the streets to venues where free food and showers are available. It had become obvious to me at this stage that I was not going to get a job without a stable address. When a support worker at the Compass Centre, run by St Mungo’s in Bristol, mentioned Emmaus I applied straight away. I liked the idea of working for food and accommodation, to me it is a way of maintaining a little dignity through a difficult period in life. My current role at Emmaus Bristol is crew member on the delivery van. The first couple of weeks mauled me physically having been office based for most of my life. The combination of physical exercise and being on the move makes the day fly by. The last three months have just slipped away so now I am starting to focus on getting back into paid employment. The routine and purpose of daily work is like ballast to a boat. My life is starting to stabilize, which in turn means I can focus more on steering in the direction I want to go. Having good regular meals and washing facilities is also extremely beneficial from a health perspective. If I hadn’t joined Emmaus Bristol, I would probably still be locked in the night shelter cycle. After a while it seems to become a way of life and people just seem to accept it. Personally, I did not like it, however I did meet people who did. It may be that those people had just given up as it’s such a hard situation to get out of. I am now focussed on getting back to work, so I can be self-supportive and provide for my daughters’ future. Having spent time in the hell of homelessness I also have a drive to develop some form of affordable housing solution accessible to all, although don’t we all? You can help us support more people like Ric in so many ways – take a look at our support page to find out more.